This is the story of the National and Local Government Officers Association (NALGO), formerly known as the National Association of Local Government Officers. Few trade unions can have been launched with quite such eminent support as the National Association of Local Government Officers. While others emerged from victimisation and struggle, NALGO could boast the town clerk of Liverpool as its first president, while among the ranks of its vice-presidents were Sir Homewood Crawford, solicitor to the City of London Corporation, the Earl of Derby, Neville Chamberlain and the knighted presidents of the local authority and professional institutes. Sir Herbert Blain CBE, who did more than anyone to create NALGO. Born 14 May 1870, Blain joined Liverpool Corporation as a clerk in 1886, rising to Principal Traffic Assistant in the Tramways Dept. He later became Tramways Manager at West Ham, and Assistant Managing Director of London Underground Railways. He was Principal Agent for the Conservative and Unionist Party from 1924-37, and died on 16 December 1942. Without one man, however, NALGO might never have been born. 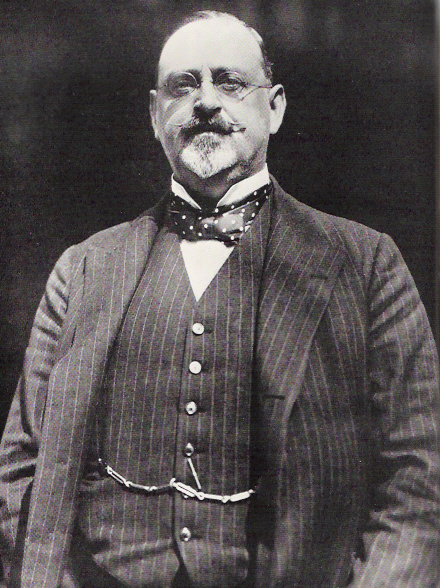 Herbert Blain, the Liverpool-born local authority clerk who would go on to manage London Underground and become principal agent for the Conservative Party in the period covering the General Strike, had first launched himself into the project of local government organisation in 1896, when he founded the Liverpool Municipal Officers’ Guild. Although there had been earlier attempts to create a body to represent local government officers, this was the first which sought to include all grades from the town clerk to the office boy. Blain sought to export his idea to other towns, and within four years similar organisations were active in Hull , Derby , Oldham, Tunbridge Wells, Poplar, Macclesfield, Belfast and in the Midlands , where one guild covered a number of local authorities. The chance to go national came in 1902, when the struggling London Municipal Officers Association approached Blain with proposal to join forces. Although the plan foundered on the question of subscription fees, Blain was not deterred. In 1903, he left Liverpool to become manager of the new tramways department at West Ham. Blain joined the London Municipal Officers Association and succeeded in reviving its fortunes along the lines of his earlier guild, just as it was on the point of collapse. In July 1905, Blain’s efforts led to a conference at the Inns of Court Hotel, High Holborn, at which 14 representatives of local guilds and other organisations, such as the Institution of Municipal and County Engineers, agreed to create a National Association of Local Government Officers. The new body could boast some 5,000 members. With Blain as chairman and Frank Ginn, assistant surveyor of Woodford and secretary of the Municipal Officers Association, as secretary, the new NALGO soon had a national executive up and running. Its members were from the founding guilds, plus those of West Ham, Ilford and Bradford. They were joined by representatives of the Sanitary Inspectors Association and the Urban Council Clerks’ Association. NALGO’s federal constitution meant that much of the activity of its early years was local – and of a social nature. However, as early as 1905, Jabez Darricotte, editor of the Bolton guild journal, proposed a mutual insurance fund which would pay a small sum to the widows and families of local government officers who died in service. By 1910, this idea had been adopted nationally, leading to the creation of a Benevolent and Orphan Fund. At Blain’s instigation, NALGO also entered into a contract with the firm of Hodgetts Ltd to endorse a magazine now to be known as The Local Government Officer and Contractor as the union’s official journal – a small but significant step towards giving NALGO’s locally focused membership a national orientation. Although neither the contract nor the journal lasted long, the principal had been established, and NALGO would continue to have a national voice. However, the idea that NALGO was a trade union was anathema to its membership. Writing in the association’s journal in September 1910, L C Hill, its general secretary, declared: “Anything savouring of trade unionism is nausea to the local government officer and his Association.” This was not only the outcome of having a leadership drawn almost entirely from the ranks of local authority chief officers, but also the result of ordinary members’ widely held view that they were the social superiors of the sort of workers who joined unions. By the close of the first world war, this attitude was no longer sustainable. Faced with competition for members from more militant organisations, and aware of the clamour to do more to protect their living standards, NALGO’s leadership sought ways of increasing its influence without having to become a trade union or, worse still, engage with the new Labour Party. Among the ideas mooted were a “Triple Alliance” of NALGO, the National Union of Teachers and the Poor Law Officers Association, and proposals to run NALGO parliamentary candidates. The continued rejection of a move to trade unionism at NALGO’s conference in 1919 created a crisis. One third of the 650 members of the Hull branch joined the rival Municipal Employees Association. When new Labour councils across the country announced that in future they would employ only union members, the leaders of other branches seceded to the Workers Union. This feeling that NALGO and its leadership was too timid was particularly strong among returning servicemen, who came back from the trenches to find that the opportunities for advancement in local government that they had foregone had been taken up by the very same people who now wanted to prevent them fighting wholeheartedly for better working conditions. At this point, and faced with the threat from many branches at NALGO’s conference on 31 January 1920 that their members would resign on mass if they continued to oppose trade unionism, the conservative leadership changed its policy. In due course, and after bitter wrangling over the precise nature of its conversion, NALGO sought a certificate from the Registrar of Friendly Societies confirming its status as a trade union, and the rot was halted. Despite a handful of defections, by the end of the year membership had risen by nearly 8,000 to 36,500. 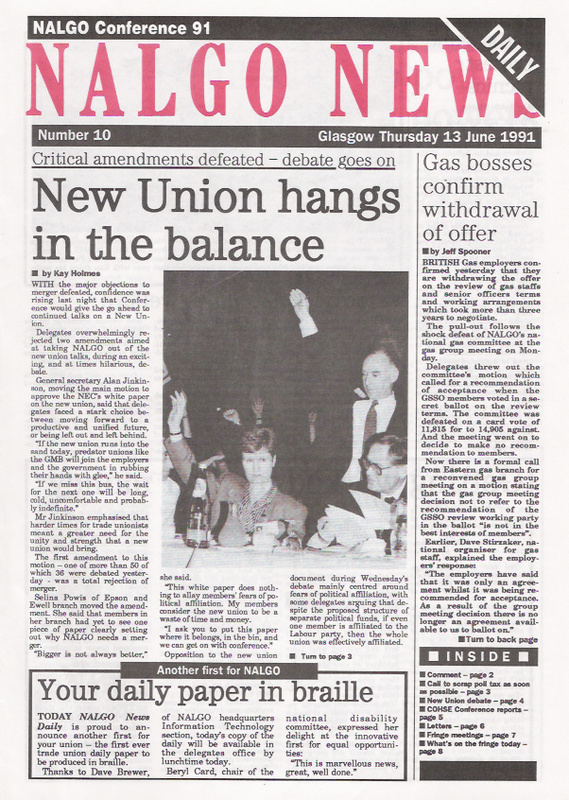 NALGO News, published as a daily during the 1991 union conference in Glasgow as delegates deliberated over progress in talks with NUPE and COHSE over the creation of a new union – eventually to be known as Unison. The obvious next step was affiliation to the Trades Union Congress, and discussion of this duly began as early as 1921. However, it would take until 1964 for affiliation to be agreed. In the meantime, NALGO continued to grow. By 1946 it was the eighth largest trade union with nearly 140,000 members. That same year, the union changed its constitution to enable it to recruit employees in other public services such as the NHS and the electricity and gas boards. Six years later, in 1952, it was renamed the National and Local Government Officers Association (though it would continue to refer to itself as NALGO). Over the years, NALGO moved a long way from its friendly society roots. In 1970, it sanctioned its first strike, and by the 1980s would be known as a stronghold of militant public sector trade unionism. However, in common with other unions, it was badly affected by the anti-trade union laws enacted by Conservative governments in that decade, and sought strength through merger with its two biggest rivals – the National Union of Public Employees and the Confederation of Health Service Employees. 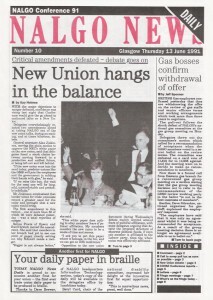 In 1993, the three unions joined forces to create Unison. Historical Directory of Trade Unions, vol 1, Arthur Marsh and Victoria Ryan (Gower, 1980). White Collar Union: Sixty Years of NALGO , Alec Spoor (Heinemann, 1967). Facing up to Thatcherism: The History of NALGO 1979-93, Michael Ironside and Roger Seifert (Oxford University Press, 2001). Papers of the National And Local Government Officers Association, Modern Records Centre, Warwick University (external link). 1909-43 Levi Clement Hill CBE Formerly a clerk in the Borough Treasurer’s department at Bolton, secretary of the Bolton Municipal Officers’ Guild, and one of the Guild’s delegates to NALGO’s NEC from its fourth meeting in May, 1906, until his appointment. 1943-45 John Simonds From 1912 to 1930 Secretary of the National Poor Law Officers’ Association; appointed NALGO’s Legal Officer, Insurance Secretary, and General Manager of Logomia when the NPLOA merged with NALGO in 1930; and promoted to Deputy General Secretary in 1936. 1945-46 Haden Corser One of the first three district secretaries appointed in 1919; promoted to Chief Organisation Officer in 1944 and Deputy General Secretary in 1945. Acting General Secretary 1945-46. 1946-57 John Herbert Warren OBE A local government officer from 1911, appointed Assistant Solicitor at Birkenhead in 1933, Clerk of Newton-le-Willows Urban District Council in 1935, and Town Clerk of Slough in 1939. He was a member of NALGO’s NEC from 1935 to 1946. 1957- Walter Charles Anderson Formerly Assistant Solicitor at Bootle and Deputy Town Clerk of Heywood; joined NALGO staff as assistant solicitor in 1937; was promoted to Legal Officer in succession to John Simonds in 1946; appointed Deputy General Secretary when Haden Corser retired in 1950; and succeeded John Warren as General Secretary in 1957. In 1965, Mr Anderson was elected to the General Council of the Trades Union Congress and in 1966 was appointed a member of the Royal Commission on the Civil Service.